The leaders of Penn State’s committee that oversaw Louis J. Freeh’s investigation personally dealt with inquiries from the NCAA and the Big Ten conference, according to an e-mail recently released from the Department of Education. 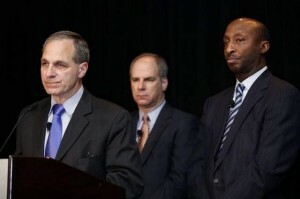 As the university’s internal investigation got under way, trustees Ken Frazier and Ron Tomalis had personal conversations with both athletic groups about their participation in Freeh’s inquiry. The December 2011 e-mail from Penn State President Rodney Erickson to Frazier and Tomalis is some of the first evidence to emerge that shows the NCAA and Big Ten conferences were in direct contact with those who conducted the investigation. It contained a letter from Big Ten Commissioner Jim Delany asking to play a role in the inquiry. It’s still unclear how much access the athletic governing bodies received. But the the involvement of Freeh investigators in the the groups’ decision making is one of the key allegations in a lawsuit led by the Paterno family. In his e-mail, Erickson asked if he could release Delany’s letter to the public. He never did. And yet the trustees that set new standards for incompetence and collusion refuse to step down, apparently believing they are above the law. Erickson,BOT and Freeh…Your day is going to come!! !